Isn't this Little Me "Pretty Monkey" newborn gown and hat set simply precious? We think so and know you will, too. The cutest and sweetest little monkey is embroidered onto the front of the gown. Gown is soft pink with tiny hot pink dots and features turn down cuffs to protect baby's tender skin. Collar and cuffs are trimmed in brown scalloped stitching to match the monkey. Collar is also expandable for easy dressing. Gown comes with the matching pink and dot hat. 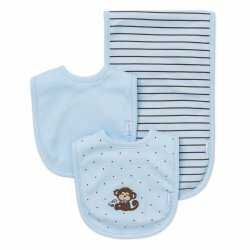 A great baby shower gift and Take Me Home set when combined with the equally precious "Pretty Monkey" blanket. 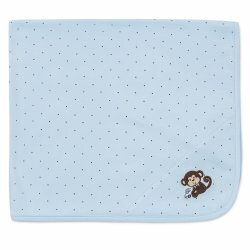 Great for swaddling baby to keep her warm and secure. Twins? Consider the matching "Monkey Star" in blue design.